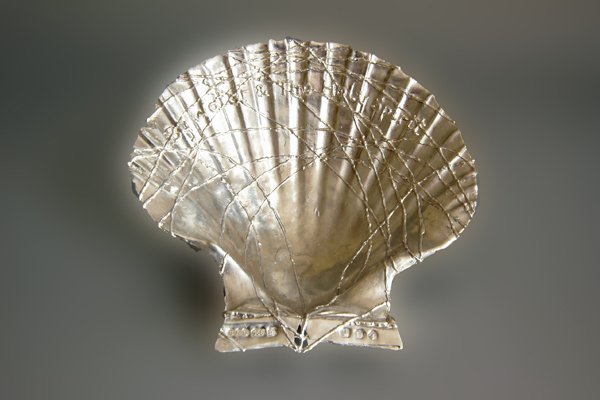 The Ashwicken Shell is a baptismal shell crafted in pure silver. The Story of the Ashwicken Shell. All Saints Church dates back to the late 13th century with the first vicar appointed about 1316. However by the mid 17th century it was in a poor state. It was the Revd. John Freeman who did much to save the Church and restore it at the turn of the 19th century which is when this story begins. Although the building is old, inside all is Victorian and according to Pevsner “not very interesting” - though he did like our Carved wooden eagle lectern. But in February 2012, thieves broke into the Church vestry and stole our Eagle. It is so very sad that stealing from a Church has become a fact of life for some and we can only try to forgive them and hope that they ultimately feel remorse. For these were not impulsive thieves but they had targetted the lectern, which is now probably out of the country, and the loss is still clearly felt. The worst of it is that it was our heritage; the eagle/phoenix representing the restoration of our Church one hundred years ago and the faith and hope of all those villagers who worked so hard and gave so much to ensure it’s revival. Our insurers, Ecclesiastical, were very helpful and we quickly agreed on a cash settlement and payment for repairs done to damage caused in the theft, but money alone could never replace the Eagle. There are similar ones available from redundant Churches but it was strongly felt that the money should go in creating something new, something that would be uplifting and symbolise our continuing belief and hope for the future. Something that would be forever ours – past,present and future. The idea of a baptismal shell was born. A simple scallop shell for our simple rural Church. 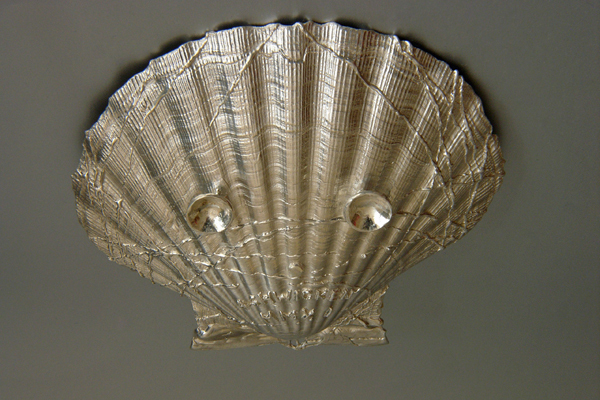 Why a scallop shell? Some early Christian art shows John the Baptist using a shell to pour water over Jesus’ head in his baptism. It is a symbol that is used throughout the church today, representing the living and moving water of baptism, which blesses our living and moving in the Spirit of God. This symbol of the shell reminds us that in baptism we are entering a life-long pilgrimage to follow in the Way of Jesus. Baptism is not a one-day event; it is the beginning of a pilgrimage. In fact, the early church was sometimes called “The Way.” Baptism was understood not so much as giving assent to a set of beliefs, but of committing oneself to a way of life, recognizing oneself as a child of God, serving in the name and way of Jesus. The form was to be as a natural as possible and we needed an artist, skilled and sympathetic who would craft the shell. We were very lucky to find Jaqueline Stieger, an artist based in Melton in Yorkshire, whose diverse practice over a period of 40 years has brought her international recognition. She is a Freeman of the Worshipful Company of Goldsmiths and was in 1986 elected as Fellow of the Royal Society of the Arts. 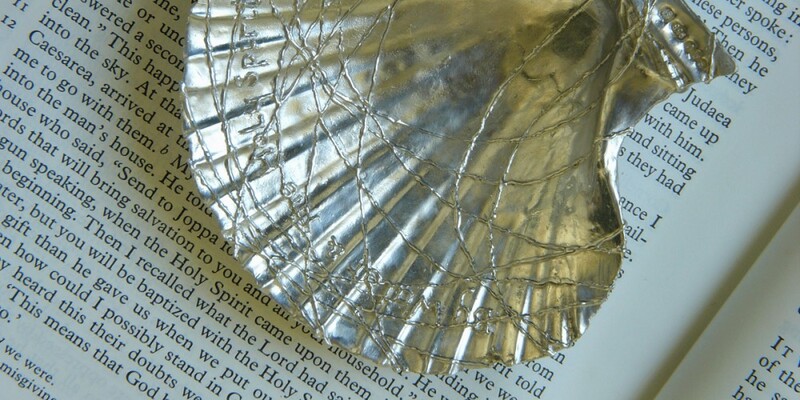 Jacqueline used a real shell adding the words “By Water & the Holy Spirit.” and the tracery of natural growth and then cast the whole of it in solid silver using the “lost wax” process. The shell then perfectly replicates that once living shell with all it’s minor blemishes and imperfections. The result is something that is intrinsically beautiful and tactile, softly reflecting all the care that has gone into it’s inception and the glory to be found in nature. It always creates great interest with families at baptisms when it is used in all our Churches. It tells it’s own story but perhaps the best story of all is how it is now used as we welcome new life to the Church and has turned despair to joy. 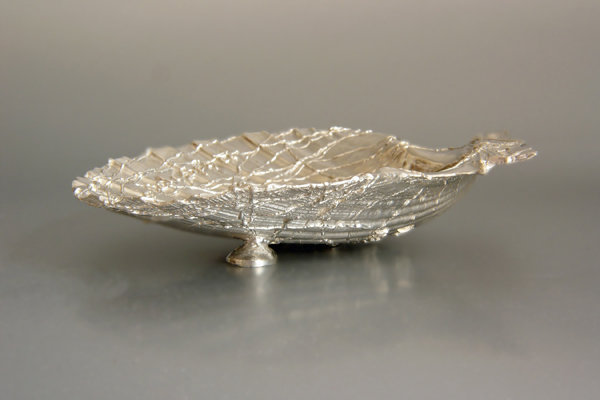 A casting made by Jacqueline Steiger in 2012 using a real shell by the lost wax process. Britannia silver 958 quality. 6.5 oz 190 grammes. Size 11 cm x 11 cm approx. asymmetrical. Marked with Sheffield Assay Office, 958 quality mark, Sheffield Rose, Britannia mark, year letter “n”, Queen Elizabeth Diamond Jubilee mark. Legend on upper front surface “By Water & The Holy Spirit.” Legend under “ASHWICKEN 2011” and makers mark “JS” on left shell lip.